OnePlus 6T, which is the current flagship product from the Chinese phone maker was launched last year in many regions including China. Introduced with a price tag of Yuan 3,399 (around $506) in the Chinese market, the company seems to have slashed the prices has been reduced by Yuan 400. It is reported that the prices are slashed across all the variants. It is believed that the phone maker could be aiming to clear the remaining stocks of OnePlus 6T to make way for the forthcoming OnePlus 7. April Fool’s Day 2019: OnePlus Co-Founder Teases New OnePlus Electric Car on Official Forum. The base variant of OnePlus 6T (6GB+128GB) was priced at 3399 Yuan which is now retailing at 2,299 Yuan. On the other hand, the variant with 8GB RAM and 128GB space was introduced at 3,599 Yuan (around $538) which is currently listed at 3,199 Yuan (approximately $476). The top-end variant with 8GB RAM + 256GB memory is now priced at 3,599 Yuan (around $538) instead of 3,999 Yuan. On the specification front, the new OnePlus 6T features a 6.41-inch AMOLED display with FHD+ resolution of 1080 x 2340 pixels and 19.5:9 aspect ratio. Protected by Gorilla Glass 6, the phone also flaunts a waterdrop notch. Under the skin, there is a Snapdragon 845 chipset from Qualcomm which is mated up to 8GB of RAM and up to 256GB of internal space. The device runs OxygenOS 9.0.5 based Android 9 Pie OS. For photography, there is a dual rear camera which comprises of a 16MP and a 20MP sensors along with a 16MP lens up front. The phone is shipped with a 3,700mAh battery along with 20W fast charging support. 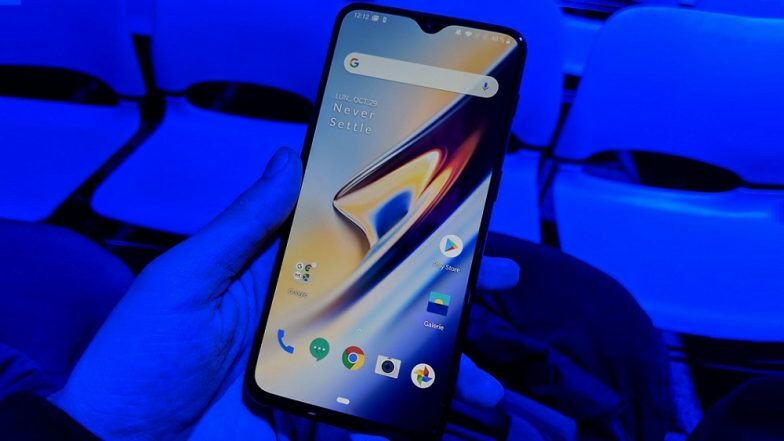 OnePlus 7 Render Images Leaked Online; Likely To Sport Three New Gradient Colours. As OnePlus 6 was launched in May last year, it is believed that the phone maker will be launching the new OnePlus 7 on the same timeline. As of now, the company hasn't revealed the specifications and features of the device. However, it is confirmed that OnePlus 7 will be powered by Qualcomm's current generation SoC - 855 chipset. We have already seen several leak case renders about the smartphone that confirms that OnePlus 7 will sport triple rear cameras. Moreover, the phone will also see pop-up selfie camera, notch-less design, AMOLED screen, in-display fingerprint sensor and much more.